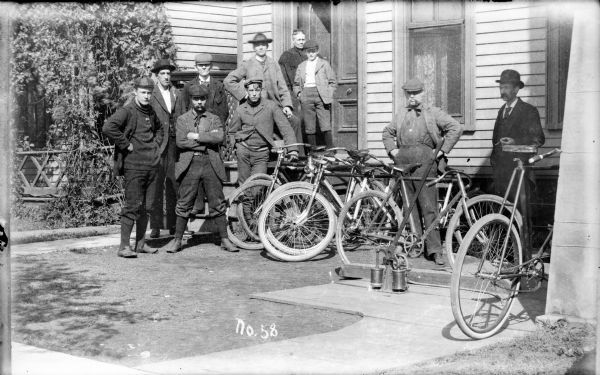 Group of men, and a young boy, standing in the small front yard of a house at a bicycling outing. A woman stands in an open doorway at the top of the steps. A man on the far right wears a suit and appears to be holding a cigar. Bicycles are leaning against a railing in front of the house. The men wear sweaters, jackets, hats, stockings, button-up shoes and knickerbockers. On top of a wood sidewalk in the yard is what appears to be a hand-pump with a long handle for putting air into bicycle tires. This glass negative is part of the Blanchard Harper Collection, but it is unclear if Harper actually took this photograph.